Peewee potatoes are washed and roasted in oil using a heavy bottomed vessel. They are then finished with garlic, fresh fenugreek leaves and spice powders. Serve tiny roasted potatoes with steamed rice. Click to learn about Fingerling Potatoes . Makes: around 4 Servings of Tiny Roasted Potatoes. Wash the fingerling potatoes and pat them dry. Heat oil in a dutch oven or a heavy bottomed vessel on medium heat. 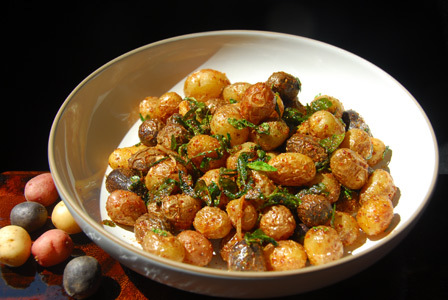 Add fingerling potatoes and cook covered for around 8 minutes or until potatoes are soft when pierced. Make sure to shake the pot occasionally to avoid potatoes sticking to bottom of the pan. Uncover stir in garlic and fenugreek leaves. Fry for around 2 minutes until fenugreek leaves wilt and garlic changes color a bit. Remove the pot from heat, stir in coriander powder, red chili powder, lemon zest and salt. Serve tiny roasted potatoes with steamed rice. Notes: Make sure potatoes are cooked right. Suggestions: Adjust spice with red chili powder or add sliced green chiles along with garlic cloves. Variations: You can also use coriander leaves or mint leaves in place of fenugreek leaves if you desire. Other Names: Tiny Roasted Potatoes. 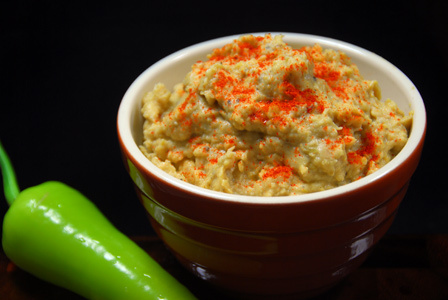 Hummus is a dip made with garbanzo / chickpeas. Chickpeas are cooked and ground into paste with tahini and freshly roasted green peppers. Tahini is prepared with roasting and grinding sesame seeds into paste. Roasted green pepper hummus can be served with toasted pita bread or with any bread of your choice. Makes: around a Cup of Roasted Green Pepper Hummus. Soak the garlic in warm water for few minutes and peel the skin. Wash, pat dry and place the green pepper on a direct flame. Let the skin char on all sides and place the charred green peppers in a paper bag. Once cool enough to handle, peel the outer skin and roughly chop the green peppers discarding the stems. Pressure cook soaked chickpeas in sufficient water for 3 whistles. Alternatively, boil chickpeas in few cups of water on stove top till chickpeas turn soft. Strain the cooked chickpeas and reserve the cooking liquid. Toast sesame seeds in a heavy bottomed pan on low flame. Once sesame seeds turn golden brown in color, remove from heat. Grind toasted sesame seeds with olive oil into thick paste. Grind cooked garbanzo beans with freshly prepared tahini paste, roasted green peppers, garlic, lemon juice, olive oil and salt. Store tight in a refrigerator to stay fresh for couple of days. Remove the roasted green pepper hummus onto a bowl and serve with toasted pita bread or with any bread of your choice. Notes: Make sure chickpeas are cooked right. Suggestions: Adjust the consistency of the hummus with reserved cooking liquid (if desired). 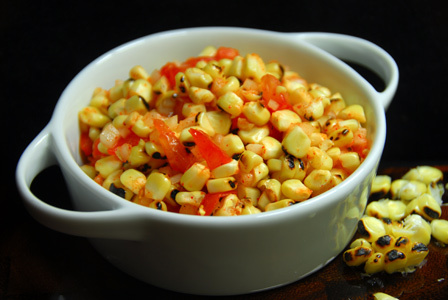 Variations: Finely chopped cilantro can be added as a garnish. Other Names: Roasted Green Pepper Hummus. Onion and whole spices are fried in oil. Eggplant is roasted on direct flame till its charred. Then the roasted eggplant pulp is mashed and added to the oil. Serve sweet eggplant chutney with steamed rice and dollop of ghee. Makes: around 2 Servings of Sweet Eggplant Chutney. Remove the stem and mash the eggplant thoroughly. Soak tamarind in few tablespoons of water for sometime and extract all thick juice. Clean, wash and tear curry leaves. Remove stem, wash and finely chop green chilli. Fry till onion turns translucent, add tamarind extract, sugar, mashed eggplant, turmeric powder and salt. Serve sweet eggplant chutney with steamed rice and dollop of ghee. Notes: Make sure eggplant is roasted well before removing from heat. 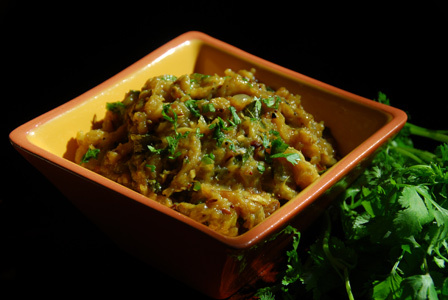 Variations: You can also check this roasted eggplant chutney. Other Names: Sweet Eggplant Chutney. Ligthly scrape, remove ends and wash bitter gourds. Chop the bitter gourd on a slant into quarter inch thick slices so that most of the flesh is exposed. Mix the chopped bitter gourd slices with all the remaining ingredients. Arrange the spiced bitter gourd slices on a baking tray without overlapping. Bake the bitter gourd chips till they change color and become crisp. It takes about 40 – 60 minutes depending on the thickness of bitter gourd slices. Store crisped bitter gourd chips tight in a jar and they stay fresh for months. 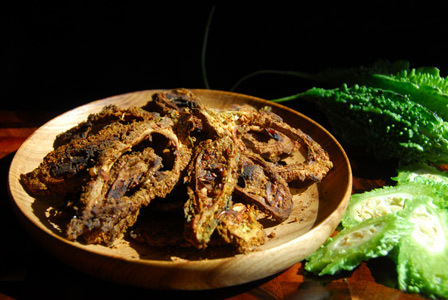 Serve karela chips with rice and plain dal or serve them as a snack. Notes: Alternatively, roast them on a grill pan or on a wide skillet on low flame till crisp.